PRX and PRI are keeping their names for now, but changes are coming to the organization formed by their merger. The newsroom of PRI’s The World in Boston. Behind the scenes, executives are reviewing departments and evaluating staffers’ expertise to determine “the most efficient merger” and to “match people to the right roles based on our priorities,” said Kerri Hoffman, the former PRX CEO who holds the same position in the new entity. “It’s safe to say that everybody in both companies will be affected in some way,” Hoffman said. Changes will address who reports to whom, where employees are based and which positions share overlapping duties. The merger, announced last month, will also bring a combined board, free services for stations, and new experiments with PRI’s The World, the network’s flagship newsmagazine. Hoffman said that if the staff review underway reveals redundancies, leadership will aim to reassign employees. The “bumpy road” the organizations are on might also spur some employees already considering moving on to leave, she said. Changes are also coming on the executive level. PRI CEO Alisa Miller will leave the organization after serving as executive chair of its board for a year. During that time, she will focus on fundraising and organizing the 29-member merged board into committees. Two other PRI executives will leave by year’s end, according to Hoffman. Melinda Ward, chief content officer, will retire; Julia Yager, SVP of marketing, sales and distribution, will also exit. With Ward’s retirement, oversight of programming that began under PRI will move to John Barth, PRX’s chief content officer. Barth said that in his role he plans to “experiment with new forms of narrative and production” on PRI’s The World. The PRX Podcast Garage in Boston. He also wants to “further tell the story of The World” by increasing promotion of the show’s original journalism to stations and listeners, he said. For a series about Afghanistan that debuted this month on the program, the organization created station promos, cross-published stories on USA Today and will host an event with the producers of the series at PRX’s Podcast Garage in Boston next month. Some of The World’s new efforts will be backed by a $10 million investment from Boston’s WGBH, which acquired PRI in 2012 and co-produces the show. The investment, announced with the merger, will also help PRX create an audio production arm of up to five new employees to work on co-productions with “key partners,” including WGBH, according to Hoffman. The division will support current customers with ad production and bonus content, Hoffman said. 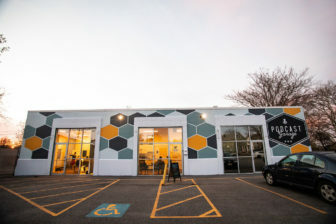 WGBH’s backing also aids creation of a second PRX Podcast Garage in Washington, D.C. The spinoff of PRX’s audio training facility in Boston will open by early next year. Leaders of PRI and PRX began discussing a merger last summer, according to Hoffman. Miller approached PRX about opportunities in podcasting and using PRX’s distribution technology, and talks turned to exploring a merger. “We thought actually combining the things that are core … and also highlighting the things that are differentiators could really be very transformative and really good for the system,” Hoffman said. While they share a core focus on distribution, PRX was attracted to PRI’s news resources, such as its weekday programs The World and The Takeaway. PRX’s portfolio of programs includes the investigative show Reveal, but as a news program, “it’s a little alone in the PRX portfolio,” Hoffman said. “We look forward to [The World and The Takeaway] and Reveal finding collaboration opportunities,” she said. Meanwhile, PRI was interested in PRX’s podcast technology, she said, which includes dynamic ad insertion, real-time metrics and shareable players and pages. The two organizations also bring complementary business models to the merger, Hoffman said. PRI has built relationships with foundations, while PRX has raised smaller gifts from listeners in campaigns such as a Kickstarter for the Radiotopia podcast network. PRX and PRI will continue using their separate names for the “foreseeable future,” according to PRX spokesperson Meggan Ellingboe. Program prices will not change through June 2019. The organization will announce new prices in April 2019 for its combined portfolio of programming, she said. PRX will begin offering stations some programs and services for free, such as PRX Remix, a program featuring content from PRX’s Radiotopia podcasts, and PRX Publish, its podcast publishing platform. 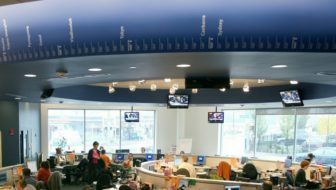 Meanwhile, the merger will change WGBH’s relationship with PRI. The merged company “still will be affiliated with WGBH but is intentionally structured to support independence to facilitate growth and new initiatives,” said WGBH spokesperson Jeanne Hopkins. “As you might expect, we’ve learned new things over the past six years, and so we have made modifications,” Hopkins said. The merged company will continue to assist WGBH with the station’s podcast strategy under a partnership that began in August 2017, Hoffman said. PRX’s Kerri Hoffman will run the new organization, while PRI’s Alisa Miller will move into a board leadership role.